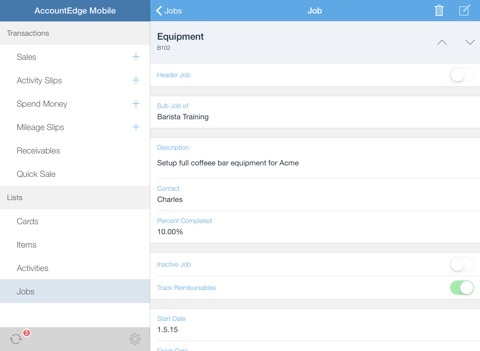 AccountEdge Mobile v4.5 is a companion app for AccountEdge Mac or Windows desktop software and is not intended to act as a standalone app. 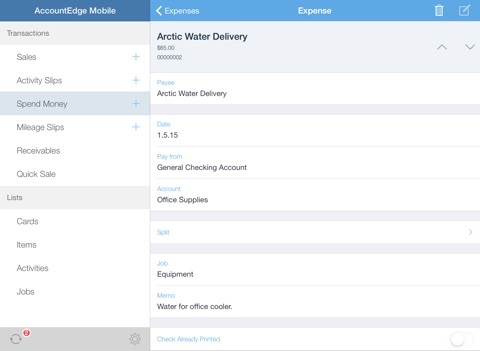 *Important Note: In order to take advantage of some of the latest features in AccountEdge Mobile you will need to use AccountEdge 2014 or later or AccountEdge Basic v2 and later with iOS 7 or later. 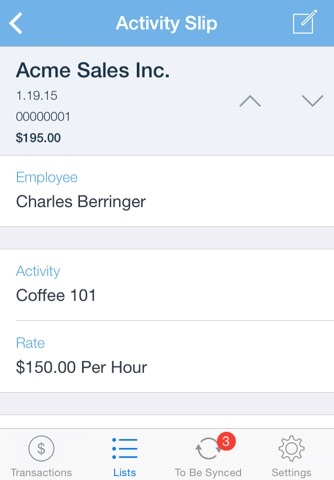 Record sales, process credit card payments, add activity slips, enter expenses and mileage, add or edit contacts and jobs, and sync it all with your desktop version of AccountEdge. Create quotes, orders and invoices, including items, services, activities, jobs, and taxes as necessary. Charge credit cards on the spot. Bill for your time when working at a job site. 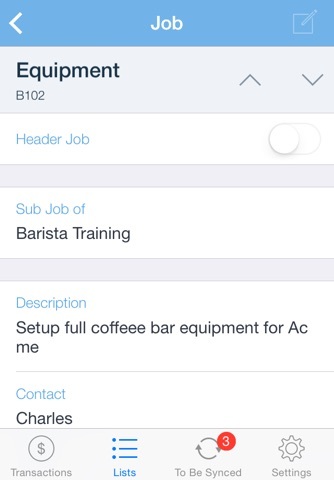 Select an activity, enter hours or units, and include the associated job. Create Mileage Slips for a vehicle or for an employee for reimbursement. View, add and edit your contacts. Create new and edit existing jobs while away from the office. Sync your iPhone, iPad or iPod Touch with your desktop version of AccountEdge for Windows or Mac (version 2014 or higher). How is information shared between AccountEdge Mobile and AccountEdge? AccountEdge Mobile syncs with AccountEdge 2014 (or higher) using Dropbox, a free and secure web-based file hosting service. AccountEdge creates lists, including customers, vendors, items, activities, jobs and sales taxes. 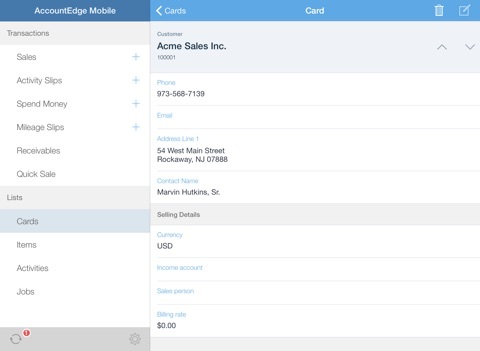 These lists are synced with AccountEdge Mobile for use in transactions. 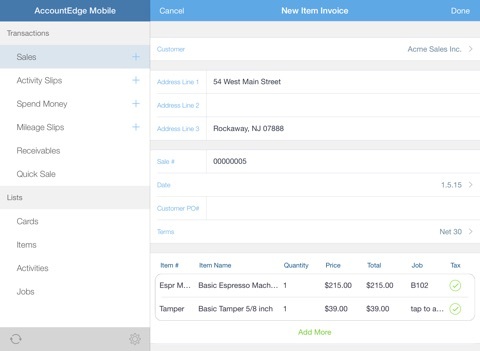 Transactions are created in AccountEdge Mobile include quotes, orders, invoices, activity slips, spend money transactions and mileage slips. 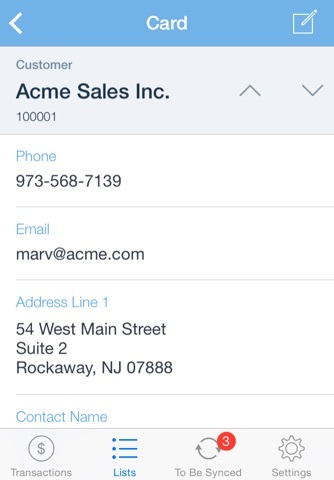 Transactions created on your iOS device are then sent back to your desktop version of AccountEdge. This update uses a new method for connecting to and syncing with Dropbox. This update will be required for all users as the previous method to connect to Dropbox has been deprecated. AccountEdge Pro v2017 and later is required to sync with AccountEdge Mobile via Dropbox. Version 4.6 also addresses some minor issues with iOS 11.